Since the launch of Google in 1998, our lives have been transformed with increasingly relevant information available at our fingertips much to the demise of the local pub quiz. 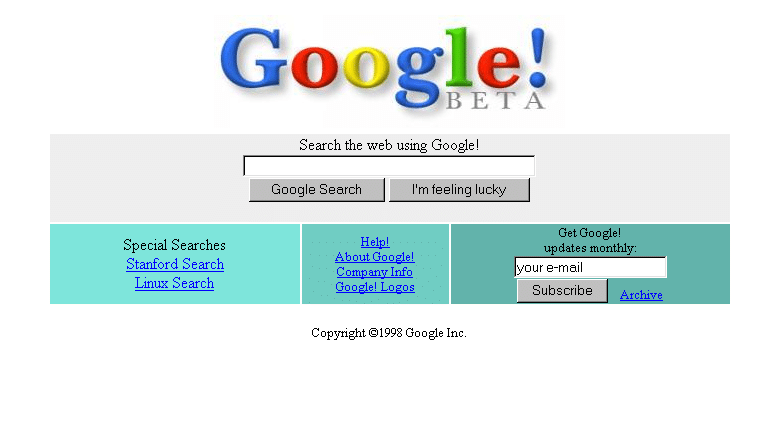 Google homepage in 1998, anyone remember this? It really doesn’t matter if you deal in organic live stock or trade on the stock exchange, a global business guru, a consultant or a hobbyist collector you cannot ignore search engine optimization on Google. Even if you don’t use Google for business, you probably “Google” something from your PC or phone on a daily basis. But in the past few years, things have been changing at Google – search results are becoming personal. Bespoke search results based on our own personal internet search history, IP locations, and potentially the people we are connected to on social media. We are not, however, just information consumers – we are creators and curators of content; with Google Plus we increasingly have the opportunity to be influencers as well. Google Search is often where this influence will be displayed and from a Google Plus perspective we see a new emerging form of (SEO), Social Search Engine Optimization. So what is Modern Search Engine Optimization all about? This kind of keyword stuffing is probably more a cliché than reality, but as you will read, there would appear increasingly to be new way – the social way – of search results appearing on Google. Social SEO should run in line with traditional SEO for maximum results. By traditional SEO we mean post Penguin and Panda updates, not spammy linking building and black hat search engine optimization. In reality Social SEO is a very simply concept; good content gets shared and is of value to the user, or customer from the point of view of Google. You create content that people relate to, then engage with (e.g. ‘share’) and depending upon the nature of the connections, you may well find that the content appears in search results. It would appear, however, the nature of the people (e.g. how much authority they have on the subject to which they engaged) will determine the results. Could it really be that the more people know and rate your approach on a subject, the more they ‘sponsor’ that content into their network through ‘sharing’ the more engagement there is more generally (e.g. ’social signals’ – numbers of +1, comments, share etc. ), the more ‘authority’ you already have in a particular area then the more likely your content will appear in search? Well, it would seem that the new form of SEO is actually back to the old form of social – if people in authority say you are an authority and your content is ‘good stuff’ then it gets more presence in Google Search than without that ‘sponsoring’, which makes sense. But this is not how people have seen Search Engine Optimization – until now it was not about ‘people’ and ‘social skills’. How did this happen? Vic Gundotra, Google’s Senior Vice President, Engineering in his chat with Guy Kawasaki at SXSW in 2012 described Google+ as a ‘social layer’ over Google’s products and services. This phrase, ‘a social layer’ is a new concept – it means that everything Google does is not socialized i.e. ‘social’ will now apply to everything they do. And social means you and me. So, whether it is the who sees your content on Google+, the social destination, or whether it is your video setting on YouTube which determine who can see that content, or your contacts within GMail, Google+ goes throughout it all. Here is a video overview of Google Plus – by the end of it you will understand how the social layer is a totally new concept. It is the new ‘Google’. How does this relate to your personal Google Search? Have you noticed how many search results now have a ‘little face’ of a person next to them? Well, if you haven’t yet you will. This can only happen if the person has a Google+ account (see authorship below) and as such, the social layer has really shown its presence within Google Search. Next let us look how that ‘little face’ appear alongside search results i.e. Google authorship. What is Google Authorship and can you get it set up? This video gives you much of the key information you need to get to grips with Google Authorship. So, why does this matter? Well, people’s image next to content would appear to be giving it a higher click through rate (CTR) than for content without (as mentioned in the video.) i.e. more people click on the link and see that content. What Google Plus content can appear in Google Search? Awesome question, this is a key aspect to grasping Google Plus, especially when it comes to search engine optimization. The world has really changed and Google Search will increasingly reflect your own connections’ content. If for instance, you share content with a group of people in a circle e.g. 100, then for those people it would be possible for them to find that post in Google Search itself, not just Google+, i.e. when they are using ‘Search Plus Your World’. In other words, it is worth noting how Google Plus posts themselves can appear in Google Search as results dependent upon who has the ‘rights’ of access (i.e. with whom that content has been shared.) This is because each post is a ‘page’ with its own URL. Also, worth noting that when these pages are shared i.e. the posts are shared, they are ‘flowing’ links from the original post/page. So in this way, everything being shared has the potential of ending up in Google Search. If you don’t share publicly you are reducing your reach, but you may be optimizing your Google Search results for a small audience when they have ‘Search Plus Your World” switched on. Growing an appropriate network for you will make a huge difference. Good luck with setting up your Google Plus business profile for modern SEO and customer service. Give us a call if you would like us to help train, maintain or develop your social media and SEO.